A hard decision or maybe not? And why is messaging the best communication channel for businesses and their customers anyway? Let’s answer all these questions and start over new! Today is a mobile-first world, everything happens mobile and online. So, how can you reach your customers on their smartphone without spending a lot of time and money building an own app? The need for businesses to use messaging should be clear. Businesses need to be where their customers are to keep in touch with them. Customers want to reach businesses easily without great effort. In return, companies want to reach their customers directly and preferably on their mobile phones. Building an app to do so would be hugely expensive and work-intensive. But there is another possibility on the market to achieve the same at much lower cost and risk – messaging services! Of course, the decision whether to use WhatsApp, Facebook Messenger, SMS or something else to be available for any customer is hard to make. What if we tell you that you don’t have to make this decision? 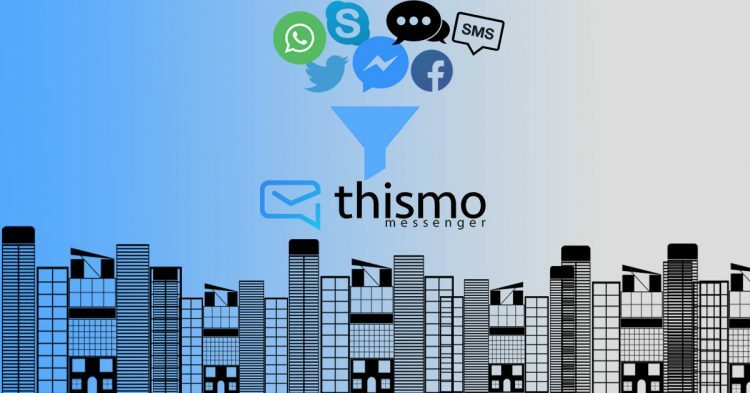 Just let your customers decide which messenger service they want to use and receive every message, no matter which messaging service your client use, with the thismo messenger platform! We simply connect the relevant messaging services to our solution. It is usable with web and mobile apps on desktop and mobile devices and make the communication with your customers easier and even more affordable. For example think about SMS: it’s a perfect solution because you’re not forced to answer on your smartphone. Your team in the office can simply do that using the web app on their desktop PC. Also, you can still follow all the conversations on your mobile device and step into any conversation at any time if necessary. Or take Facebook Messenger: it is not longer necessary to add every employee to the Facebook page members and provide therefor access to your business Facebook page. Furthermore, if you want to use a chatbot to automate simple Q&A sessions you do not longer need to build separate bots for every messaging channel. Build it once, connect it with thismo messenger and provide your customers the same perfect experience on all messaging channels. That even works with our thismo web messenger which you should use as a live chat replacement on your website. Just add it to your website and let your website visitors message you or your chatbot. There are still customers who don’t want to get an offer for something new in between all the private messages of friends and family. Many don’t even want to share their private mobile number. They fear of instantly get annoyed with new offers or after-sales calls. So, the advantage of thismo over messaging services like WhatsApp or even Facebook Messenger is that thismo is only for business messages. With thismo they simply login with their email and their name, search for your business and they’re ready to start messaging. That’s it. To offer thismo messenger to your customers sign up a business account with your company’s name. Integrate your individual messaging link with a simple link on your blog, web shop or business page or put it in as a QR-code, button or pop-up window. You can use the desktop version to answer your customers messages. Want to know more about the thismo messenger platform? For a business it’s very much important to have a good communication with your customers as well as with your employees. As a business owner we must have a communication medium like messenger for discussing work related things. So thismo is the right platform for business owners to use for their work purpose.